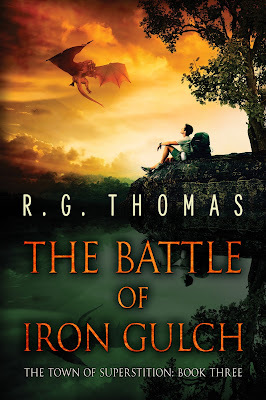 Tuesday, January 10, saw the release of The Battle of Iron Gulch, the third book of my Young Adult fantasy gay romance The Town of Superstition series. What started out as a prompt driven story with The Midnight Gardener - The Town of Superstition: Book One, and continued with The Well of Tears - The Town of Superstition: Book Two, is now continuing. Thaddeus Cane, who's been through so much in his fifteen years, his father, Nathan, Thaddeus's boyfriend, a garden gnome named Teofil Rhododendron, and Teofil's mother, Miriam, brother and sister, Fetter and Astrid, and their elf companion Dulindir, are nearing the end of their journey to Wraith Mountain. Thaddeus has gained confidence not only in his decision-making, but in his ability to perform magic as well. At the base of Wraith Mountain is the small town of Iron Gulch. It is a mining town slowly fading into memory after a catastrophe at the mine. It is here that Thaddeus and the group must find lodging so they can prepare for their trek up the mountain. While Thaddeus is eager to begin the climb, his father tells him that they need to procure supplies, which will cost money, of which they do not have much. So in Iron Gulch they find a bed and breakfast where they trade chores and home repairs for lodging. During this time, Thaddeus works on his magic abilities with his father. I've really enjoyed the dynamic between Nathan and Thaddeus Cane. I'll admit, Thaddeus is a bit of a goody-goody, but he's been particularly sheltered during his childhood. Below's an exclusive excerpt from The Battle of Iron Gulch - The Town of Superstition: Book Three, in which Thaddeus's father instructs him on using magic. Thaddeus Cane has finally reached the foot of Wraith Mountain. He hopes to soon find his mother, Claire, who was cursed by the witch Isadora when Thaddeus was just a baby, and bring Claire back to Superstition to live with him and his father, Nathan. With Teofil, his garden gnome boyfriend, and Teofil's mother, sister, and new elf friend Dulindir, Thaddeus discovers, however, that getting to his mother will not be as easy as they'd hoped. They are forced to find shelter in the small town of Iron Gulch as Thaddeus's father takes a job in order to secure the equipment they will need to climb the mountain. The longer they stay in Iron Gulch, the more Thaddeus feels things in the small town are not as pleasant as they appear on the surface. When a new and vicious enemy suddenly reveals itself, Thaddeus and his group will have to battle not only for their own lives, but those of the residents of Iron Gulch. As the battle rages on, they find Thaddeus's mother, and turn their fight to free her and end Isadora's tyranny once and for all. “Where do you think magic comes from?” Thaddeus asked. “Magic is an extension of our bodies," his father said. "It starts inside of us, and there’s been some argument over the years about where, exactly. Some say it starts in the brain, where the outcome of the spell is imagined, but others think it comes from the heart, where the spell caster’s true intention is harbored.” Nathan looked out over his arm. A row of weeds fell over as if they had been cut, starting from just beneath Nathan’s fingers and extending out in a straight line. Thaddeus gasped and looked from the path in the weeds to his father’s grinning face and back again. Thaddeus let it slip from his hand. Thaddeus looked between the rock at his feet and the edge of the parking lot, gauging the distance. He furrowed his brow and stretched his arm and fingers down, pointing to it. He focused his thoughts on the rock, imagined it flying through the air and landing at the far edge of the lot. Maybe if he closed his eyes. Thaddeus stretched his fingers even farther toward the ground. He could recall the memory of how the rock had felt in his hand, but it didn’t feel like he was holding it again. Sweat beaded across his forehead and a line of it ran down his side, even though a cool breeze was blowing. He put all of his energy into grabbing the rock and flinging it across the parking lot. Just when Thaddeus thought he would never be able to do it, he felt something in his palm. It was rough-edged. Crumbly. He gasped and opened his eyes to find the rock sitting in his hand. When Thaddeus looked up, his father was smiling at him. “Did you mean to pick it up?” Nathan asked. Thaddeus blew out a relieved breath and hugged him tight. When Nathan pulled back, they looked at each other and laughed again.